We have a complete line of Benjamin Moore® products and many other premium paint supplies. 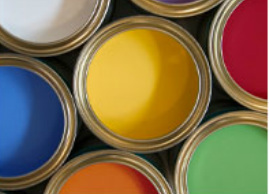 Visit our Paint and Paint Supplies page to learn more. Sign up for our email newsletters to receive the latest news, DIY ideas and savings offers. We are selling reusable shopping bags in conjunction with Coffees Country Market. Proceeds go to the Old Lyme Phoebe Griffin Noyes Library. Fill your "Green Bag" with some hats and gloves and supplies from Laysville Hardware for the perfect holiday gift. Come see our refurbished LED bulb department for an easy way to get your home a little greener. For more ideas on how you can get greener visit our Go Green page.